The trust owned 3,200 shares of Lam Research Corporation (NASDAQ:LRCX), a $6.5 billion market cap manufacturer of equipment that is used in turn to manufacture semiconductors. Its most recent quarter, which ended in September, was decent news: while earnings were down 96% from the same period a year earlier, this actually beat estimates and caused the stock to rally from its decline in 2012. It is now down 3% year to date. Lam, which had also delivered strong revenue growth, trades at 10 times forward earnings estimates as Wall Street analysts expect considerably better numbers next year. Billionaire Leon Cooperman’s Omega Advisors liked the stock last quarter, increasing its position to 1.2 million shares. We would like to see better numbers from the company to convince us it can hit the trajectory set by analysts. Apple Inc. (NASDAQ:AAPL) was the most popular stock among hedge funds in the second quarter of 2012 according to our database of 13F filings (see the full rankings) and Cramer is a fan of it as well as his trust owned 175 shares. Apple Inc (NASDAQ:AAPL) is encountering increased competition from a relentless Amazon, a desperate Microsoft, and an ambitious Google but still has a strong brand name and market position. It also trades at a trailing P/E of 15, which seems rather low given all the other favorable characteristics of the stock. Analyst consensus implies a forward P/E of 12 and a five-year PEG ratio of 0.6. Even if its growth slows Apple (NASDAQ:AAPL) should still be a good value at current prices. Cramer’s trust disclosed a position of 3,900 shares of EMC Corporation (NYSE:EMC). EMC is a data storage and information software company with a market capitalization of just over $50 billion. Its trailing P/E is 21, but sell-side analysts expect the company to grow its earnings in the next several quarters and their estimates for 2013 imply a forward P/E of 13. Its earnings were up 19% in the second quarter compared to the second quarter of 2011, based on revenue growth and higher margins. We’re a bit wary of the degree to which EMC is depending on growth over the next few quarters to justify its valuation, but we wouldn’t consider it overpriced either. Broadcom Corporation (NASDAQ:BRCM) was another of the trust’s holdings in the tech sector, with a position of 2,700 shares. Broadcom provides semiconductor products which enable video and voice communications as well as general data transfer. Its business has been struggling recently, with net income lower in the second quarter than in Q2 2011 despite a better top-line, but analysts expect higher earnings in 2013 and so Broadcom carries a forward P/E of only 11 and a five-year PEG ratio of 0.8. We’re cautious of such rosy estimates, and think that other stocks on this list are better values . 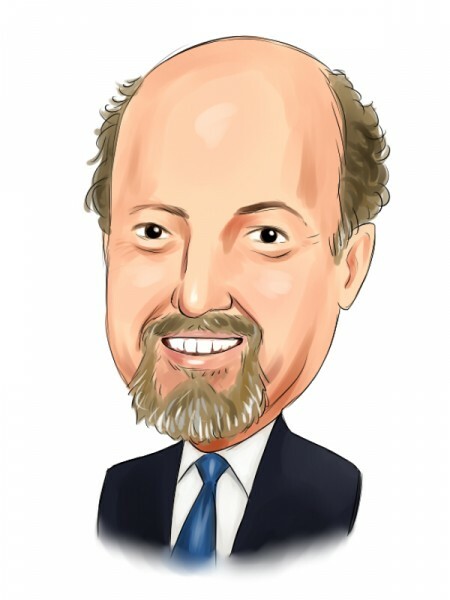 Another of Cramer’s top tech stock picks was eBay Inc (NASDAQ:EBAY) as his trust owned 1,800 shares of the auction site and owner of Paypal. These businesses have been driving eBay’s financials higher, as in the third quarter the company saw double-digit growth rates of both revenue and net income compared to the same period in 2011. eBay trades at 17 times trailing earnings; it’s not quite as attractive as Apple, but we think it should continue to deliver good earnings growth and is therefore a good value play. Read our most recent analysis of eBay. Disclosure: No positions in Apple Inc (NASDAQ:AAPL) or any other stocks mentioned in this article. Apple Inc (AAPL), Microsoft Corporation (MSFT): Tablet Wars Is AIG Still A Good Value? Is David Einhorn In More Trouble At Marvell? A Board Member At This Big Bank Is Buying Google Inc (GOOG), Facebook (FB): Is The New Millennium Over? Is Google Inc (GOOG) A Screaming Buy After The Earnings Miss?